Sobha Morzaria Grandeur Phase II: Live the high-life with luxury apartments and world-class amenities! Bangalore is a vibrant city that is one of the most loved cities in the country. This is where you can find a life that is peaceful, luxurious and totally high on comfort. In fact, the real estate market in Bangalore has come a long way over the years and has a lot to look forward to today. Sobha Morzaria Grandeur Phase II is the latest residential project by Sobha Limited that offers a premium lifestyle you have always desired. Spread over a land of 1.77 acres, this development consist of 2 structures (G +9) that offer variants of 2BHK and 3BHK luxury apartments with area sizes starting at 1541 sq. ft. and going up to 2160 sq. ft. 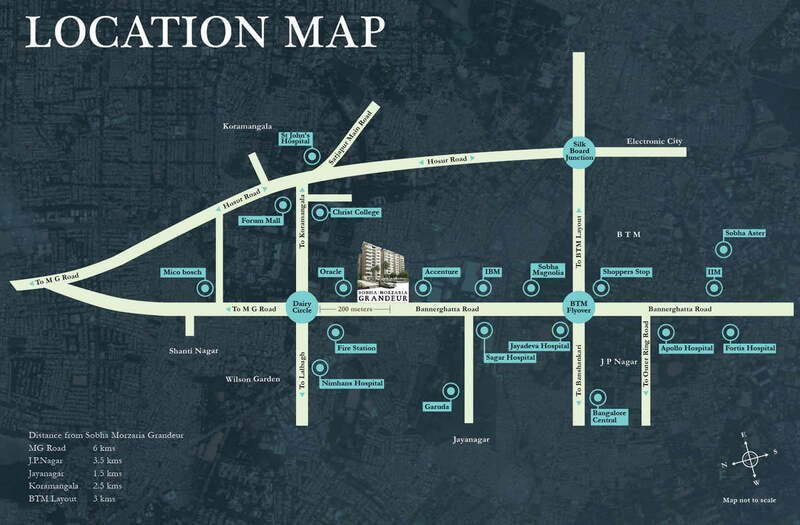 This development is where you will find all the luxury space you need and will never run short of. Sobha Morzaria Grandeur Phase II Bangalore is a world-class residential development filled with luxury and comfort for a new and modern-day lifestyle. With a number of internal and external amenities, there is a lot to look forward to at this development. The apartments are nothing short of spectacular and contain luxury furnishings and fittings, lavish rooms, high-end flooring, premium kitchens, plush doors and windows providing beautiful views, gorgeous private gardens, electrical ports located perfectly, high-tech safety features and a lot more that you and your family will find too hard to resist. The external amenities at this development are outstanding and help you relax, unwind, stay fit and just have fun with your family and friends. The external amenities include a clubhouse, swimming pool, well-equipped gymnasium, jogging track, indoor/outdoor sports facilities and a play-area for kids, party hall, landscape garden, efficient car parking, high-end security and more. This development also helps the environment by taking-up rain water harvesting, organic waste conversion and sewage treatment. Situated at Bannerghatta Main Road, Sobha Morzaria Grandeur comes in close proximity to a number of landmarks and provides ample convenience, each and every day. You can easily access places like universities, schools, banks, ATMs, hospitals, medical & research centres, cinemas, malls, restaurants, cafes, supermarkets, shopping centres, offices, commercial areas, all kinds of public transport, etc., within minutes and without the need to travel long distances. High-end luxury does come at an affordable price and that is exactly what Sobha Limited gracefully proves once again with its Phase-2. Starting at a fabulous price of Rs.1.51 Cr., the Sobha Morzaria Grandeur Phase II price is unbelievable and totally affordable. Luxury apartments with private gardens at such a decent price tag are very hard to find in Bangalore, but this renowned real estate company makes it possible. There are different payment plans that you can opt for according to your preference and you can also avail beautiful home loans. Sobha Group: The trusted name in Indian real estate industry! Sobha Group is one of the leading names in the real estate industry in India. Founded in the year 1995, the group since then has come long way in terms of real estate developments creating every project a masterpiece of the city skyline.Headquartered in Bangalore, the real estate giants have been developing projects mainly in 9 cities namely Chennai, Coimbatore, Bangalore, Calicut, Mysore, Cochin, Thrissur, Pune and Gurgaon.The Group is also best known for its commitment to quality, dedication to satisfy customers and on time delivery of projects.The group is also the recipient of over 170 prestigious awards including National Ranking in Track2Realty Best Practices Report 2019,CIA World Construction & Infra Awards - Best Developer 2018, CARE AWARDS 2017 in the category of 'Best CSR activity, Prestigious TMA - HLL CSR Award 2016, CREDAI CSR Awards 2015 in the category of 'Child Welfare' and many more. Located at Bannerghatta Main Road, Bangalore. Sobha Morzaria Grandeur Phase II is really amazing project by Sobha Developers. The location of the project is a great advantage with modern amenities as well as project is well connected with various loops.